How exciting! New restaurant signs are popping up all over the Highlands. No sooner than we broke the story about Shiraz Mediterranean Grill opening a location on Bardstown Road, we received a message from a reader, alerting us to Ramen Inochi opening on Highland Ave, and to J. Gumbo’s Cajun restaurant returning to the building where they started it all at 1616 Grinstead Dr. I had to see for myself, so I drove by yesterday and caught Donald Fox — brother to Billy Fox, Jr. who co-owns J. Gumbos with Jason Cardwell — there as he was working with crew to get it ready. He told me that this building is where J. Gumbos started before outgrowing the space in around 2000 and then spreading franchises to 22 different states since. He says they plan to open by the end of next week and have special plans for Mardis Gras, although the details are still being worked out. He’s right in saying they’ve changed. He said they were closing the Frankfort Ave location, but in a twist of events, he let me know later last night that his brother decided to buy it from their father. 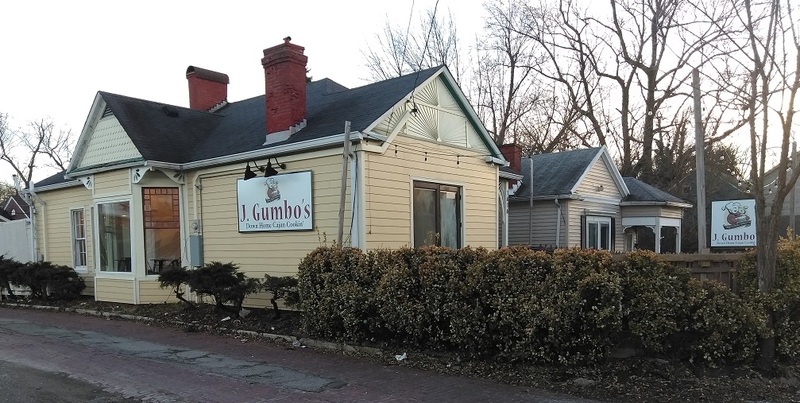 J. Gumbo’s will also be adding a food truck and changing up their menu by adding tacos and nachos. The old/new location at Bardstown Road is almost ready. The wooden floors and doors are freshly stained under 20 two-seat tables that are wooden with metal legs. ( I almost found out about the fresh stain the hard way when I opened a door that was still wet.) There is metal seating for about 40 people, but that will be increased to about 50 once they get the patio ready. Fox said they plan to tear down the fence and bushes around the patio and add cool lighting for a hipper atmosphere. In April, they plan to start serving beignet and coffees on Saturday and Sunday mornings. Now, they just need to add the Mardi Gras, brightly colored art to the walls. Fox said this store will be a flagship store all over again, where they will roll out any new changes and also bring people who are interested in owning a franchise so they can learn. Hours of operation will be Sunday through Thursday from 11 a.m. to 9 p.m. and Friday, Saturday from 11 a.m. to 11 p.m. The food truck will sit in the parking lot in front of the Cricket Store across Grinstead Drive on Friday and Saturday nights to serve late night bar crowds until 2 a.m.